Commonwealth Heads of Government marked the 60th anniversary of the modern Commonwealth in 2009 by reaffirming the values and principles we share, and that bind us together. Values come from the heart, and lie at the heart of the Commonwealth. Promoting them is an important part of education. As Aristotle wrote, over 2,000 years ago, ‘Educating the mind without educating the heart is no education at all.’ In this year when the Commonwealth takes as its theme ‘Women as Agents of Change’, another of Aristotle’s observations comes to mind – that a society cannot be happy unless its women are. It seems that human wisdom has always been with us, we need only to be guided by it. Commonwealth programmes stress the importance of technical education to enable women to play their full part in communities economically through employment and enterprise, as well as socially and politically. Technical and vocational education and training (TVET) is an important strategy for preparing women to take their place in the workforce, bring empowerment to them and help break the cycle of poverty. When our programme for the 2009–12 triennium was set by Commonwealth Education Ministers at the Kuala Lumpur meeting in 2009, it defined girls’ access to education and completion as one of our focus areas. Comprehensive provision of quality education for girls in Asia and sub-Saharan Africa is a priority in our work at the Commonwealth Secretariat. Gender-related work in schools also encompasses initiatives to tackle boys’ underachievement. This is a particular concern in the Caribbean, and during a recent visit to the region I was able to meet some of those participating in innovative projects dealing with this issue. In Jamaica, I saw the work of Youth Upliftment through Employment (YUTE), which places special emphasis on mentoring and skills upgrading. YUTE has also upgraded my vocabulary by making me aware of that typically Caribbean word, ‘upliftment’. It describes very aptly what we are trying to achieve through our Commonwealth education partnerships. 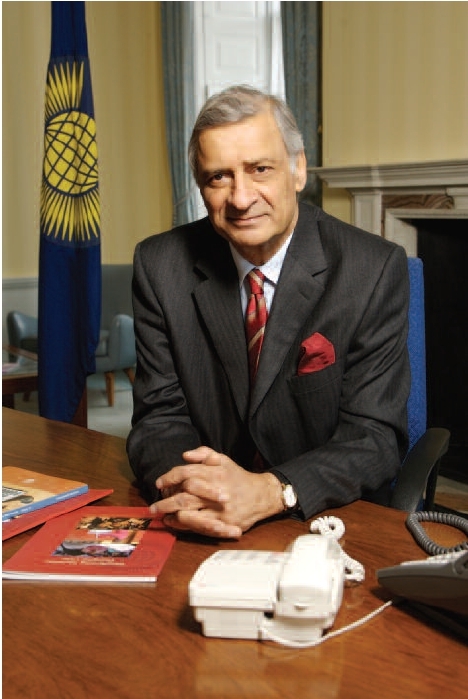 One of the comparative advantages enjoyed by the Commonwealth Secretariat lies in our ability to cross-connect and open doors to facilitate access. In the course of my travels, in addition to meeting ministers and senior government officials, I often spend time with bankers and the business community. Being able to link them to youth training and empowerment schemes where they can mobilise skills from the private sector to support mentoring and employment training is a key contribution to the economy and society. Mentoring helps bridge the generational divide. Schools and colleges need to draw on educational assistance, in its broadest sense, which is available from the wider community. Although some parents and other more mature members of the community may not have had much formal schooling, they have experience, and many have skills that can be of value to children and young people and to the school curriculum. Building resilience by ensuring access to education in difficult circumstances is another Commonwealth priority. This means addressing the challenges of education delivery during situations of crisis and limited capacity through multi-grade teaching. Mobility and retention of local teaching skills are critical to improving quality in education. The Commonwealth Teacher Recruitment Protocol aims to balance the rights of teachers to migrate internationally, on a temporary or permanent basis, against the need to protect the integrity of national education systems, and prevent the exploitation of scarce human resources in developing or low income countries.